Is your little one afraid of clowns? If they answered “No” then they are way more brave than we were at their age! That, or they aren't scared of clowns because they know the secret to making clowns scared of them. They just need to dress up in this creepy Psycho Clown Costume, and pesky clowns won't be a problem any longer! So many people are terrified of clowns, that there's even a name for it (it's called Coulrophobia, and if you're not sure if your kid has it or not, we don't recommend hiring a clown for their birthday party, or you might find out really fast) and there have been scientific studies to try to figure out why. But has anyone ever looked into what give clowns themselves the heebie jeebies? Do silly clowns, that just look like they want to help everyone have a good time, get spooked out by other clowns too? We aren't licensed clown-researchers, but we'd bet that a menacing, sinister-looking jester would have all of the other clowns shaking in their giant red shoes. It's the perfect look for your little spooky prankster (or “spookster,” which we just made up) to wear if they want to creep out some average clowns! Your kid may want to be careful who they wear this costume around, because it is seriously scary! 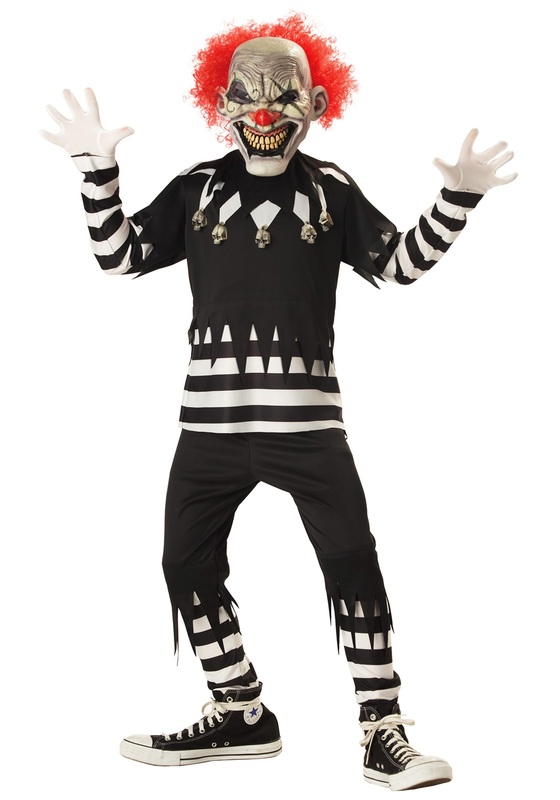 But if everyone is in on the chilling fun, then this spine-tingling latex mask and creepy clown outfit will bring lots of gasps and laughs to their friends. They can even add a pair of our giant clown shoes for an even more hauntingly hilarious look, and they'll be every clown's worst nightmare! I bought this online because my son had to have it for Halloween. I was late ordering and he had to wear it because there was no time to get another one, but this costume was very cheaply made. The mask was wadded up in a ball for shipment and that's exactly what it looked like on. The instructions said to put a hair dryer on it to mold it into place. Well, there was no molding this in place. It looked terrible and the eyes were all lopsided on his head. The fit wasn't good anyway but it was so distorted! Worst. Costume. Ever. i should have listened to the reviews on this one. Next time, we won't buy without trying on first! My son who is a typical size M kid (8-10) is unable to wear the costume since the mask seems to be sized for an adult. It is so large that my husband is the only one in the family that can wear the mask. Grandson wanted this costume, so nana gets it! It was very inexpensive so I wasn't expecting top quality! It does run small, so size up incase you need to put a sweatshirt under! It was the mask that I am disappointed in. It was folded in half and so out of shape! I am going to see if I can put something in it to fill it out without bothering my grandson when he wears it! He is six and takes a size 7/8 so I got the 8/10 but it just fits perfect if he doesn't wear anything under it! So I am going to order the next size! The mask should be made a little different, otherwise my grandson is happy with it and it is a Halloween costume and it's for one night! this costume runs small an XL fits like a 10/12. Very thin fabric, when my son went to pull up the pants the elastic waistband came out of it. The mask was crumpled up and we actually had to go buy a different mask because we couldn't get that one to straighten out.